Pasta al Pomodoro Fresco | Pasta & Co.
My dad used to cook this pasta for me and my mom, when she was working, finishing up the fashion collection on a Saturday morning. He was home with me, and I remember sitting in the kitchen, watching him brown the garlic and add the perfect last buttery touch before plating up. Try it out, you will love it with its easiness and sweetness. 1) Wash the tomatoes, cut them in half and put them into a sauce pan over medium heat. They will start releasing water and smash in 5-6 minutes. Remove from heat, pass them in the food mill and let it stand. 2) Fill a pot with 2/3 of salted water and bring it to boil. 3) Warm olive oil with garlic in another sauce pan over medium heat. 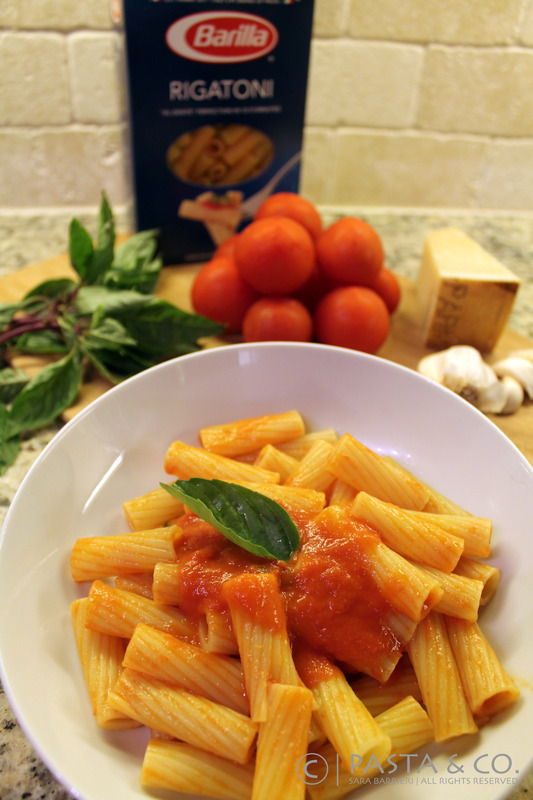 When garlic is golden, add the tomato sauce you just prepared. Chop basil and add it to the sauce. Let it thicken. 4) Add rigatoni to boiling water and cook till “al dente”. 5) Drain pasta and pour it into the sauce and mix well. Add a leaf of basil and serve immediately. The secret to this tomato sauce, is letting the sauce thicken nicely and blend in 1/4 tbs of butter, doing it right before pouring the pasta into the sauce.